As I take each piece from the worn, cardboard storage box, I marvel that it they have lasted so well for almost 40 years. This will be the 38th Christmas that I have set up my special Nativity scene. It’s very traditional with special touches added from my childhood and throughout our married life. The first piece is the stable, looking a little worn; some of the thatch is coming off the top, probably a lot like the first stable in Bethlehem. 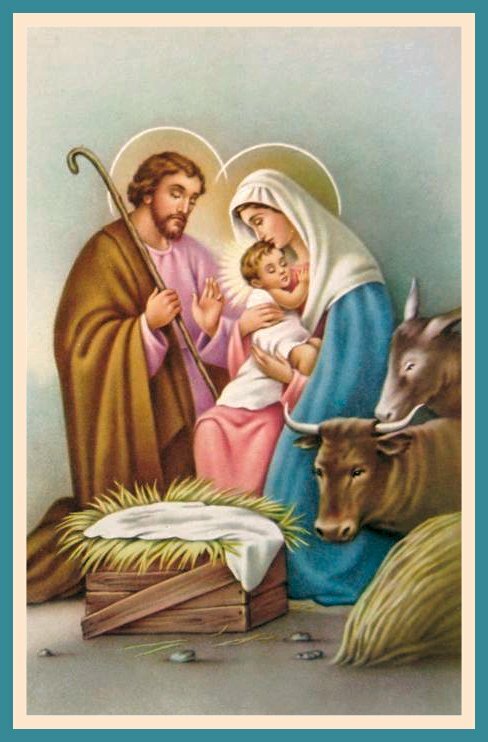 Mary and Joseph are then placed in the stable along with a cow and a donkey. I also place two special white lambs that I have had since I was a young girl with my first Nativity scene. The Innkeeper stands outside with his lantern, making sure they are settled comfortably. It’s a humble setting for a couple awaiting the birth of such a special child. Next, I place the Shepherds and sheep into the field, off stage from the stable. I imagine the surprise of those long ago herders who were suddenly given amazing news by the Angels. The good news of the Holy birth came first to humble men in the fields, rather than to the Royalty of the land. They didn’t question the Angels, but left their flocks and went in search of the Baby Jesus. From my storage box I take out the Angels, an eclectic assortment collected over the years. I place them near the Shepherds and their sheep. None of the Angels came with my original Nativity set, but have been gifts or former Christmas tree ornaments. They are now a special part of my Christmas tradition. Hark, the Herald Angels sing; glory to the new born King! When we bought the Nativity in one of our first years of marriage, it came with only two wise men. A few years ago Allan surprised me with the third Wise Man as well as an Inn Keeper to upgrade my set. The Wise Men, who didn’t come to the Holy family until some time after the birth, are placed further from the stable, making their way, following the Star. I don’t have a Star in my collection; but it is always there in my mind. I think it is interesting that the Wise men are not mentioned in the Luke 2 story of the first Christmas but are in the Matthew Gospel. Likewise, the Shepherds are not mentioned in Matthew but are in Luke’s story. Together, the two Gospels tell the story of the birth of Christ. On Christmas Day the baby Jesus is added to the Nativity. Okay, so many years I don’t wait and have the completed Nativity throughout the Advent Season. But some years, I move the Shepherds and Wise Men closer throughout Advent and on Christmas, the birth of the Christ Child is represented by placing the manger and baby in the Nativity. We have many traditions and holiday symbols of the season. But to me the Nativity is the most moving, the most representative of what Christmas is all about.